After eating dinner at the airport with Lindsay, I went to catch the bus back to the terminal for my flight for which I had already checked in. On arriving at the bus stand, I discovered that the inter-terminal buses were no longer leaving every 5 minutes but every 20 minutes. I had just missed one and my flight was due to take off at 9:20 pm and the next bus wasn’t until 8:40 pm. I tried not to panic. There was nothing I could do but wait and hope that I would make it. When I finally did make it to the correct terminal, I ran. My sandals were hampering me so I took them off and ran barefoot. A woman with a walky-talky yelled at me and I told her I was late and kept running. I pushed my way to the front of the security check queue and another person on a walky-talky asked me if I was for the Emirates flight. I said yes and kept running. 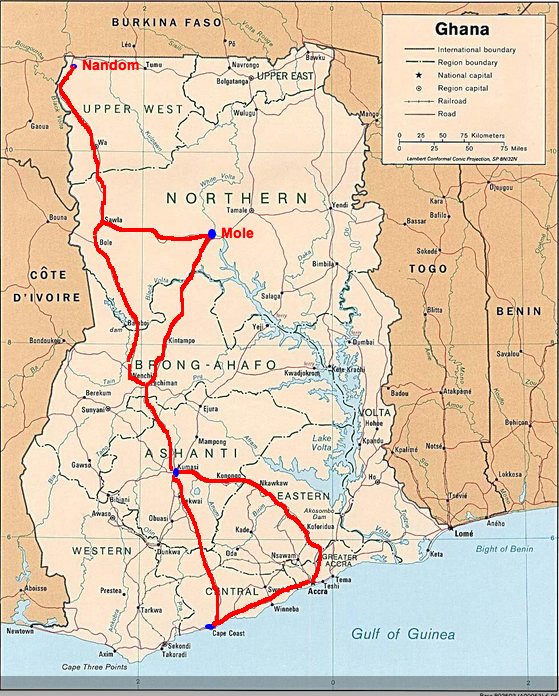 Our journey from Accra to Nandom and back. No queue at passport control. “You’re late”, said the officer. I kept running, holding my papers in a plastic folder in one hand and my sandals in the other. My elasticated pants weren’t tight enough so they were falling down a bit as I ran. I didn’t care. I was running barefoot with my gut hanging out through Narita airport! People were yelling at me from behind but I didn’t have time to waste so I kept running. The yelling became more insistent and I realised I was being chased. I turned. Two people, both waving boarding passes were trying to catch me. I had dropped them and hadn’t realised it. I finally made it to the gate and just in the knick of time. I was the last passenger to board. They switched off the lights as I walked, covered in sweat, down the gangway onto the plane. So much for the shower and clean clothes I had put on in preparation for the 20 hour journey I was about to have. So my trip began, covered in sweat and with a near miss. I reached Accra after a fairly comfortable trip as both flights were half empty so I had space to lie down and sleep easily. In the evening I returned to the airport to pick up Lindsay and Ruth who were both arriving at similar times. We all showered and changed, ordered meat on a stick for dinner and enjoyed the last night of air-conditioning for the foreseeable future. We arrived in Kumasi from Accra after the most comfortable bus ride I’ve ever had in my life. Unfortunately, it set a standard for Lindsay that we were not able to repeat for the remainder of the trip! Both Ruth and I were gobsmacked at how much quicker and easier the journey between these two cities had become since our last visit. In Kumasi we picked out some beautiful material to get sewn in Nandom and visited the cultural centre where neither Lindsay nor Ruth had visited before, to watch local artists make traditional and non-traditional arts and crafts. 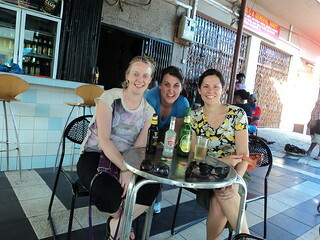 The highlight for me though, was my first Smirnoff of the trip! Smirnoff is my bottle of choice in Ghana! After the most comfortable ride ever, our next leg of our journey was more of what Ruth and I expect for travel in Ghana. After making several inquiries about best possible way of continuing north to Wa and getting a variety of responses, we ended up taking a taxi to what we thought would be our best bet for a bus that day. At the bus station, we inquired about transport to Wa and Nandom. It turned out that the bus went all the way to Nandom and left at 4 pm to arrive in Nandom at around 6 am the next morning. Immediately Ruth and I were suspicious. I asked if that was Ghana time or Obruni (white person) time. He smiled. I had a bit of a skirmish with the taxi driver on the way back to the station that afternoon. He had a different concept of customer service to my own. Before entering the taxi, he had assured us he knew the place we were going and we agreed on a price. We hadn’t driven more than a few hundred meters when he paused to ask another driver for directions. He ended up taking us to the wrong station. Eventually we got to the place we wanted to go but then we had a bit of a dispute over the price as he wanted us to pay more than what we agreed on. I stuck to my guns though and eventually he gave up and left us in peace. It did leave a bit of a sour taste in my mouth however as in the end I was quibbling over the equivalent of no more than a US$1. If I could do it again, I would give him the extra money. I forgot where I was. We knew the bus wouldn’t leave at 4 pm but we were back waiting at the station about this time. It gave us a chance to look around for some food and buy water and supplies for the trip. Between the three of us we took bets on what time the bus would actually leave. We finally left Kumasi at 7 pm that night. Lindsay, the new-comer to Africa, won the bet. We arrived in Nandom about mid-morning. We settled in to our comfortable accommodation at Nandom Senior High School where we were given a huge bungalow with water and ceiling fans! And then the greeting began! We took a turn on campus to greet all our old neighbours and then headed down below to see the Viiru family. I got to drink my first pito for the trip and I was in heaven! 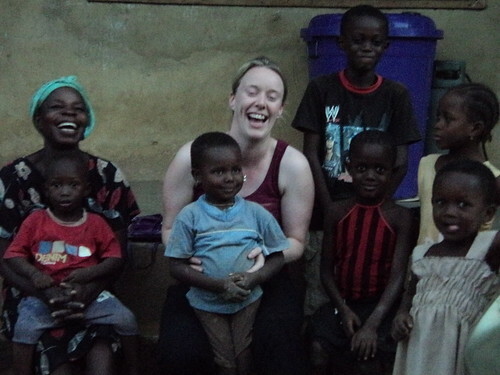 Ruth (the white one) with the Viiru family. Every Sunday is like Christmas in Nandom! 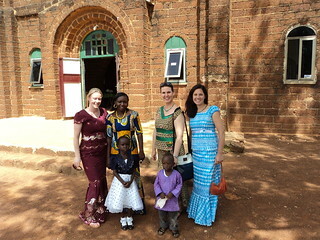 First we got all dolled up in our up-and-downs and headed into church for more greeting and a sing and a dance. We were lucky to score the angry priest as I call him for the service. At the end of his sermon, he made sure everyone was aware by stating “I’m finished”. After communion, he berated the choir master on his choice of song. All of this was done over a failing address system which made it incredibly difficult to understand the speakers. This wasn’t a problem for me though. The choir chose lots of songs that I knew and as I had my trusty hymnal with me, I could sing along merrily. I also got right in the mood for dancing and enjoyed doing my version of the Ghanaian chicken dance twice as I went up for collection. You may notice that my up-and-down is not as beautiful as the other womens’. I chose to wear the one I had made out of the Nandom SHS school cloth, so that everyone would know who I was. Lindsay is sporting one of my favourite numbers that I can no longer fit in to and Ruth has found herself a Ghanaian seamstress in Ireland where she had her lovely outfit sewn. Under the mango trees with the usual gang. My favourite part of Sundays! 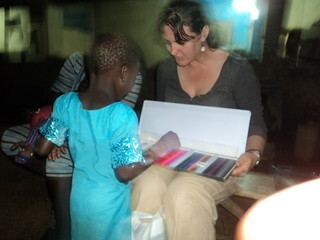 This was all about the greeting, the eating and the gift giving – my favourite part of the trip! We ate with the brothers on Mt Zion at the school for breakfast each day which was a great start to our busy days. We had dzo-dzo and TZ at the Viiru’s and with Basil and Eunice. We had ground nut soup and fufu again with the Viirus and light soup and dzo-dzo with TZ made by Alice with the help of Charles at Uplands. We watched the Netherlands v Argentina game at the Yeltule Annex Down Below with Georgie-bear and Basil’s family. Lindsay and I had our last night in Nandom on Thursday where we enjoyed a delicious roasted guinea fowl with Georgie-bear and Thomas Walier. Lindsay did well to cope with all the food and she tried everything. Perhaps she tried one thing too many though as the kule-kule I bought her from the market to snack on did not seem to agree with her all that well. These are simply small balls of hard-baked and grounded goundnut. The next day, she was sick. She was wiped out for the entire day and I had to run in to town for supplies on more than one occasion. However, as many people pointed out to her, she survived her initiation into Africa! And she was up and eating again the next day like a trooper! 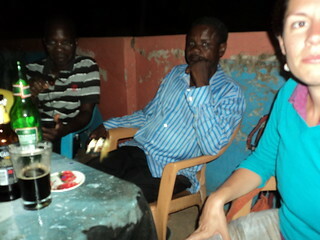 Apart from food poisoning, Lindsay also got to enjoy another quintessential Ghanian experience. The Ghanaian party. 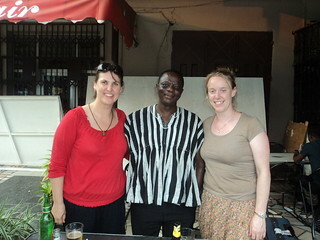 Lindsay of course was new to this and new to Ghana in general and didn’t know what a chore these ‘parties’ can become. Ruth and I were very much relieved when we got through the bulk of the agenda fairly quickly with the speeches being nice and brief. The food was delicious and I had one of my old favourites – bean stew with boiled yam. Everything was casual and going along nicely until we got to point number 7 on the agenda. Ruth and I were looking nervously at the Ghanaians at the table, but they all had their heads down and it looked like we were going to get away with no further speeches. Then Lindsay spoke. My heart sank. Every member of the party proceeded to speak for at least ten to fifteen minutes about their experience working with Brother Nicholas. It went on and on and on. Finally, exhausted, after a mammoth sitting, the closing prayer was said and we all made our ways home. On our way back to the bungalow, Lindsay simply said, “I’m sorry.” It wasn’t her fault. She wasn’t to know how these things can turn out. 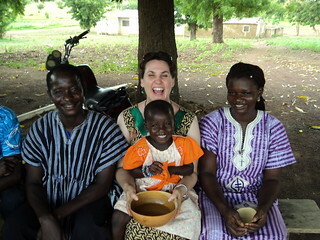 And I was glad that she got to learn something unique about Ghanaian party culture! My birthday! Lindsay and I left Nandom and Ruth behind to head to Wa. We stayed at Ruby’s place. Ruby was also a VSO volunteer when I was there however she has stayed on beyond her contract to continue her great work there. 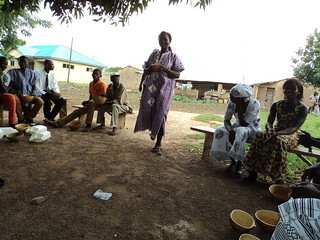 She has since started her own NGO and works primarily with women to empower and train them to increase their own capacities to sustain a secure livelihood for themselves. She’s a legend! I had high hopes for my birthday dinner. I thought it would be nice to have a western style (or at least as close as you can get to this in rural Ghana) dinner at a hotel in Wa with Lindsay and Ruby. Unfortunately, Ruby’s program in a neighbouring town meant she couldn’t get back until too late so it was just Lindsay and I. Then the real disaster struck. No smirnoff at the hotel! That’s right people, I spent my 40th birthday entirely sober. So sober that I tipped the fresh pineapple that I ordered for dessert all down my top and on to the floor! 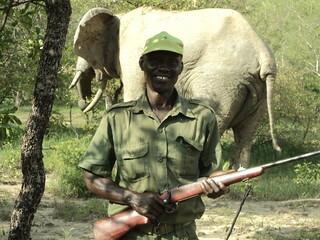 Our safari guide and an elephant he had shot earlier in the ear! 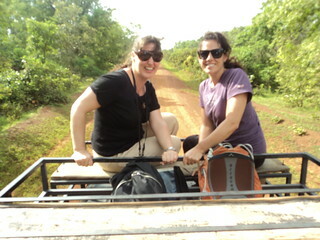 Me and Lindsay on safari! Brother Nicholas had kindly offered to drive Lindsay and I to Mole National Park. This is the only park with wildlife in Ghana. West Africa as a whole is fairly devoid of animals as they’ve all been chopped (eaten) many years ago. The park is small and doesn’t have a huge array of animals but it is famous for its elephants. We were lucky to see a one and lots of baboons, warthogs, antelopes and a single, solitary monkey. After spending the night at the brothers’ house in Domango near Mole, Brother Nicholas continued as out tour guide. He took us to Katampo Falls and a great monkey sanctuary where the villages taboo monkey meat and so these animals have managed to survive. Neither place or even Mole, had I visited before, so I was glad of the chance to see a little bit more of the country I love. Br Nicholas and I at stage one of the falls. 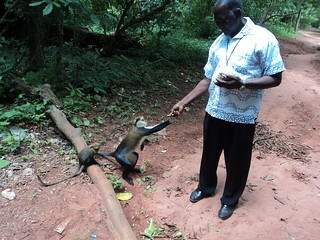 Br Nicholas feeding a monkey at the sanctuary. Me, Albert and Ruth. I’m back on the smirnoff! After having lunch with Br Nicholas’ family and me finally getting to eat my favourite (palm nut soup with fufu), we entered a tro-tro (local transport) and headed for Kumasi. Here I got to catch up at last with my dear friend Albert and we reunited with Ruth! He had big news to tell us. His wife has won the green card lottery and will be off to the USA next year! This is a huge deal as apparently they have been entering the lottery for years and there are hundreds of thousands of entries for just a hand-full of places. We are looking forward to finding out to which part of the States she will be going to and if we can help out with any contacts. Funnily enough, on the plane journey home, I was sitting next to a young man who was travelling to the US from Ghana to be with a sister who was already there. It was his first time on a plane. He had no idea what to do so I helped him as the stewards had difficulty understanding his Ghanaian english. One of them said to him that he should feel free to speak French! Even the most basic things were difficult for him. When the drink trolley came around, he wanted a malt. This is a very popular non-alcoholic drink in Ghana which I’ve never seen anywhere else. I explained to him that he would have to give up on a lot of things he was used to in terms of food and drink. I think this surprised him a lot. I wonder how much Albert and his wife realise they will have to give up on their adventure to the US. Our last few days were in Cape Coast. 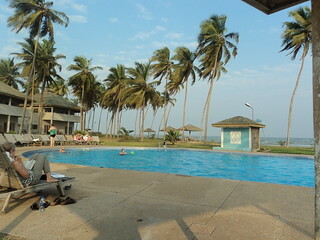 We stayed at the Elmina Bay Resort which I can’t recommend highly enough. It was beautiful. 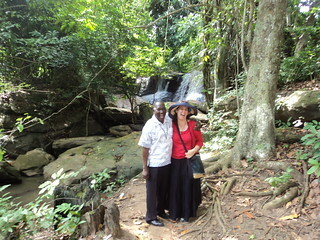 We took Lindsay to the tree top walk and two slave castles – Cape Coast and Elmina. Lindsay and I stocked up on malaria meds just in case and we enjoyed hot showers and a picturesque swimming pool to end our trip in style. 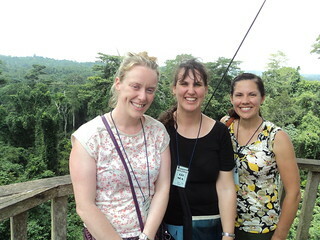 Ruth, me and Lindsay at the tree top walk. So that was our trip in a nutshell. We had it all, good food, great friends and just enough of a runny bottom to know that we were in Africa, without getting in the way of a great time!